First Sentence: Bombay is awake. Reason for Reading: Continuing on my journey in books outside the U.S., I decided that Bombay, India was the next stop I would make. I enjoyed the first book by this author I read the year before. Synopsis from Barnes and Noble Website: At the wedding of a young man from a middle-class apartment building in Bombay, the men and women of this unique community gather together and look back on their youthful, idealistic selves and consider the changes the years have wrought. The lives of the Parsi men and women who grew up together in Wadi Baug are revealed in all their complicated humanity: Adi Patel's disintegration into alcoholism; Dosamai's gossiping tongue; and Soli Contractor's betrayal and heartbreak. And observing it all is Rusi Bilimoria, a disillusioned businessman who struggles to make sense of his life and hold together a fraying community. Comments: Taking readers into the hearts and minds of several residents of Wadi Baug, Thrity Umrigar leads us through their pasts, sifting through the memories of love, loss, guilt, and long held pride. This is a novel about life, regrets, and survival. There was also a part of the story, sort of an undercurrent that later would become more prominent in the book, of the classism and cultural differences between religious and ethnic groups. The author’s writing style is beautiful. It flows well and took me right into the lives of the characters and into the heart of Bombay. Ms. Umrigar has created characters whose plights raise an unavoidable sympathy. I wanted to shake Rusi out of his self-imposed fortress, make him let go of his pride and realize that he and Coomi still have a chance at finding the happiness they thought was lost long ago. My heart ached for Tehmi, her loss of love and her will to live beyond just mere survival, and also for Soli, who watched love walk out the door and gave up. I grew frustrated with Dosamai and her desire to stamp out the happiness of others that she herself felt she could not have, her heart darkened by bitterness. I laughed at the image of Jimmy chasing the pig, cheering him on for the sake of love. And then there was Adi Patel whose guilt drove him to the bottle and from the woman he loved. I came away from this book with a feeling of melancholy and yet also with a sense of hope. I felt sadness for all the time wasted on guilt, regret, and anger. Still, I felt hope because of the love that still exists in the hearts of many of the characters, the community’s protectiveness and togetherness, and for the future. 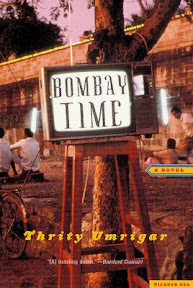 Bombay Time is a book I see myself wanting to read again at some later point in my life. Favorite Part: The story of Tehmi and Cyrus. Miscellaneous: I wish I had chosen a different time to read this particular book. My reading mood is craving something lighter after having read so many thought provoking and rather heavy topic books.